Irwin Introduces New Marples Woodworking Saw Blades What Are You Working On Today? Expect to shell out $50 for the system if you’re in the market. We suspect the big question will be whether that 8-10 feet of wall space is valuable enough to spend $50 to get it back. It looks like a neat system, even if you’ve now traded space for a dangling cord in the middle of your shop. This screams DIY… (as long as you’re not a DIY dummy). I made my own out of some lag hooks, rope, and a couple pulleys. Set me back just over 10 bucks. I suspect other toolmongers would do something similar before shelling out 50 bones. Quite right, what Jeff & Dave said! Just to be clear, the block-and-tackle provide a 4:1 mechanical advantage, but you’re only lifting approximately half the weight [the hook at the other end takes load] so it *feels* lighter. As phrased currently [and I realize it’s yanked almost directly from the Racor Website] it sounds like you get an Actual 8:1, which you just don’t. Also, what keeps the ladder from sliding sideways in the strap and then subsequently flipping sideways out of the end-bracket? Just installed my racor today…. That exact thing happened. It is being returned tomorrow. Too much of a liability. I’ll chime in with the others and say I made the same thing for my garage about 2 years ago with about $10 worth of pulleys, rope, and a boat cleat on the wall. Mine also has a bar running between the ceiling joists, so that my ladder also acts as the “stairs” to my garage attic loft. To think I could have patented this! We’ve used some $12 Amazon setups to hoist bikes in our loft. The two halves are separate, so it would be fairly easy to adapt it to work for non-bicycle sized objects. I hoist my 46 lb downhill bike without any problems. I used those same lifts for a couple kayaks. Worked great. I just had to turn the pulleys and hooks to be inline instead of perpendicular. Have a similar DIY rig that I’ve been using for about 20 years for my canoe (Also use the open body of the Canoe for seasonal storage) No fancy pulleys though just a couple lengths clothesline, two big eye lags in the ceiling rafters and a couple of boat hitches on the walls. Its always worked really and probably only cost me about $10 in material. I’ll chime in with the same DIY mention. Don’t have the wall space to strap a ladder to and I’m not hoisting the ladder too high since my garage ceiling isn’t very high. Just used some lag bolts and chain along with carabiner style clips and lift it over my head clipping up one side and then the other . I just made one of these. I used two lag eye screws and a 1000lb boat winch from Harbor Freight. Just strung the cable through the eye bolt, ladder then clipped the winch hook to the second eye bolt. Works good, but take a lot of turning to get up. That’s pretty cool. Familiar with miners’ hanging baskets? I made a U shaped bracket out of 3/4″ pipe, and slipped a piece of cpvc pipe over the horizontal piece as a roller. The top of the pipe is at the same height as the top of the garage door header. I lift the far end up onto the pipe and push the ladder until it’s just inside the garage door. I then close the door, set the end of the ladder on the garage door header, and use a short length of rope to tie it to an eye bolt in the header. When I got a second long ladder, I turned the U into an E and put both of them up there. There are bike lift racks that work equally well. 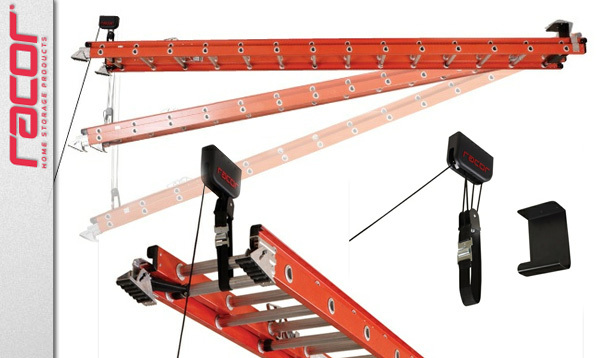 The problem witch the racor is it’s rated for 150lbs so at maximum range, you have the lift a 150lb ladder into the ceiling mounted cleat, then hook up the other end. The bike lift rack drops hooks at both ends and takes both ends up at once. Whilst I understand the principle. I am not clear with the fulcrum fixed point from the drawings and pictures. It appears that the fixed “hinge point” is achieved on the top rung, the issue for me is that rather than hinged at the very end of the ladder, it is hinged some approx 8″ further down. As the ladder is lowered the end of the ladder with go up (around the hinge point) and strike the ceiling unless the hinge accounts for this.